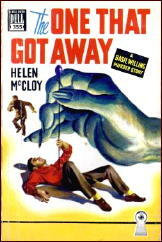 » Reviewed by William F. Deeck: HELEN McCLOY – The One That Got Away. Reviewed by William F. Deeck: HELEN McCLOY – The One That Got Away. HELEN McCLOY – The One That Got Away. William Morrow, hardcover, 1945. Hardcover reprint: Detective Book Club, 3-in-1 edition, January 1946. Magazine appearance: Detective Novel Magazine, January 1947. Reprint paperback: Dell #355, mapback edition; no date stated . There may or may not have been an escape by a German prisoner of war in Dalriada, Scotland. Lieutenant Peter Dunbar, a psychiatrist who is interested in youth delinquency, is assigned by his commanding officer, Basil Willing — also a psychiatrist and a continuing character in McCloy’s novels — to find out if there was such an escape and where the German soldier might be hiding. As soon as Dunbar arrives in the area, however, he becomes involved with the adopted son of a famous, albeit not much read, author and the author’s tripe-writing but best-selling wife. The boy keeps trying to run away from home for reasons unknown. In the most recent episode, the boy, in full sight of a watcher, vanishes on the moor. He also pulls the same trick later, more or less. Dunbar, who was supposed to have been watching him, is busy ogling a young lady. Dunbar’s talents as a psychiatrist ought to be enhanced by his ability to read eyes. He knows when they have a twinkle in them, are wary and calculating, are full of tragedy. Since there are only two men in the area who could be the German escapee, if there is one, Dunbar’s ability to read the messages in eyes ought to make his task easy. It doesn’t. After two deaths, one in a locked-room-type situation, Basil Willing has to step in and clear up the case. A good plot, some interesting characters, and enough misdirection to confuse both Dunbar and me. Perhaps if he hadn’t fallen in love at first sight, he might have been able to do better. I didn’t have that excuse. McCloy, among other things, was Mrs. Davis Dresser, aka Mrs. Brett Halliday. I’ve always liked the Willing novels among which Through a Glass Darkly, The Goblin Market, and Mister Splitfoot are standouts. She was also one of the few writers to use her heroes military service as the background for plots involving that service — whereas most had their hero solving some case while home on leave. If you don’t know Through a Glass Darkly read it. You’ll never smell the scent of lemon verbena again without a shiver. Another author I’ve read only a handful of books she wrote, out of about two dozen or so that were published between 1938 and 1980. She died in 1992 at the age of 88. One I definitely remember reading was TWO-THIRDS OF A GHOST (Random, 1956) but the copy I read was the Detective Book Club edition, which came out in March, 1957. Even though I’m sure it’s of interest only to me, I mention the date because it was in the first shipment of books I received from the club, after the initial offer of “free” books, after which you were obligated to buy a certain fixed number more. I would have been 15 years old, and I probably understood about half of what was going on. 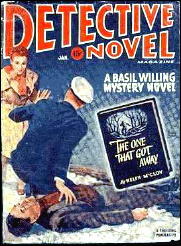 That Basil Willing was a series character I’m sure I didn’t realize, but if I did, I wasn’t impressed enough to go out and find more of his books, as I was the Perry Mason novels, which were the primary reason I joined the club. All of the free books (maybe seven for a dollar) that I got for signing up! I’m sure I’ve read other books by Helen McCloy — a few of the titles sound very familiar — but none stick to mind like GHOST. H.R.F. Keating picked Mister Splitfoot as one of his 100 Best Crime novels, and many name Through a Glass Darkly and The Goblin Market as outstanding. TAGD represents what Frank D. McSherry called the Janus solution, where the solution of the mystery has a rational explanation, but leaves the supernatural one open as well. It pits Willing against a case with what may be a genuine doppleganger with evil intent. It’s a chiller and a good detective novel with a strong line of suspense as well.